Citation Information: J Clin Invest. 2006;116(3):797-807. https://doi.org/10.1172/JCI26961. The cystic fibrosis transmembrane conductance regulator (CFTR) Cl– channel plays vital roles in fluid transport in many epithelia. While CFTR is expressed along the entire nephron, its function in renal tubule epithelial cells remains unclear, as no specific renal phenotype has been identified in cystic fibrosis. CFTR has been proposed as a regulator of the 30 pS, ATP-sensitive renal K channel (Kir1.1, also known as renal outer medullar K [ROMK]) that is critical for K secretion by cells of the thick ascending limb (TAL) and distal nephron segments responsive to aldosterone. We report here that both ATP and glibenclamide sensitivities of the 30 pS K channel in TAL cells were absent in mice lacking CFTR and in mice homozygous for the ΔF508 mutation. Curcumin treatment in ΔF508-CFTR mice partially reversed the defect in ATP sensitivity. We demonstrate that the effect of CFTR on ATP sensitivity was abrogated by increasing PKA activity. We propose that CFTR regulates the renal K secretory channel by providing a PKA-regulated functional switch that determines the distribution of open and ATP-inhibited K channels in apical membranes. We discuss the potential physiological role of this functional switch in renal K handling during water diuresis and the relevance to renal K homeostasis in cystic fibrosis. Electrophysiological characteristics of ROMK channels in the apical membrane of mouse cortical TAL. Representative single-channel recordings of a cftrtm1Unc-cftrhFABP transgenic mouse (mCFTR–/–; A) and a cftrtm1Kth transgenic mouse (ΔF508-CFTR; B) ROMK channel in an inside-out patch configuration at different –V: 0, –20, –40, –60 and –80 mV (left). Maximally open state (O) and complete channel closure (C) are indicated. Single–channel I-V curve (A, upper right) shows slight inward rectification with a slope conductance of 32.1 pS. 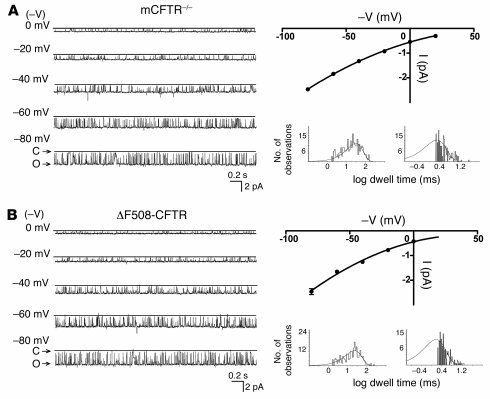 The ΔF508-CFTR mouse had similar electrophysiological characteristics to the mCFTR–/– mouse (lower right). I(pA), current in picoamperes.